Doctor Hauzer English 1.0 - Original Music. NOT Youtube safe, copyright flags. Doctor Hauzer English 1.0 - Custom Music. Youtube safe. I wrote the music for this version so I could let's play the game properly. Use this if you plan on recording. I also like this music set better, but I'm biased . Game is ready, feel free to spread the word or post about it!! - All remaining Japanese lines are translated. - Fixed up script based off feedback. - Opening cutscene: Found in a .anim file, haven't found how to open this. Translations are in the .rar file though as "translations.txt"
- Save often. You can save almost all the time (unless there's a scripted event in the room) and you CAN die often. Last edited by ArcaneAria on Sat Oct 08, 2016 9:46 pm, edited 6 times in total. I can't beta-test right now -- maybe in a couple weeks -- but I just wanted to say that the work you're doing is awesome. So glad you've taken this on, the first 3DO fan-translation ever (at least in English)! Right now, i'm downloading it and i'll tell you (or not) what i think about it. 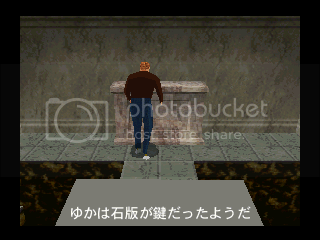 ArcaneAria wrote: - Ending cutscene: Images similar to Hauzer Journals; will work once BMP -> CEL issue is resolved. You can't use MakeBanner for that. CDoty wrote a utility that converts any image, background and sprites from BMP files to CEL format. He even released the source code for it. Be careful, it only supports CEL in 16-bits format, not the 64-colors CEL format that is sometimes used by games. This is what i actually used for my 3DO Homebrews, i'm surprised you missed that. Anyway, you can download it here. The binaries are in /Invades_newlib/Bin/ and the source code is in /Invades_newlib/Sources/. From what i gather, the book pages are simple images so use BMPTo3DOImage.exe for that. Last edited by blabla on Wed Mar 30, 2016 7:54 pm, edited 1 time in total. Took a bit of fiddling, but got it to work successfully with bmpto3docel.exe! Loads just fine in the game without crashing. I've only created images for the first Hauzer memo, so I'll finish up the other memos and the ending, then post that as an updated iso later in the week! Dr. Hauzer Beta 2 is ready! Going to modify the initial post and put links in there. - Opening cutscene. This is in a .anim file and I don't know how to modify that. - Item descriptions. Lot of work without much benefit. - Main menu Operations option. Same as if you hit select, but it's an animated video version. Hitting select in the game will tell you the controls in English. ArcaneAria wrote: Dr. Hauzer Beta 2 is ready! Going to modify the initial post and put links in there. But there is indeed no easy way to modify them or even see them. Can you give me them too? blabla wrote: Nice job ! Wow, this is a great start! I played Beta 2 for a couple hours earlier today and I really like it so far. The terse, minimalist nature of the translated text actually adds to the feeling of mysterious dread that the game imposes. Are you planning to translate all of the text in the game? I'd love to be able to understand the intro, or even the item descriptions! The idea of this going all the way, and being the first full Japanese-to-English translation of a 3DO game makes me very excited! One minor detail that caught my eye: The background of the "Can't save here!" screen shows a Japanese menu. It's a minor detail that doesn't detract at all from playing the game, but I thought I would bring it up, on the off chance that anyone would care about such a minor nitpick. It would be nice if an English image could be made, but I understand that there are much more important things to worry about for now. I probably just sound spoiled, coming from playing those ultra-polished Nintendo fan-translations. Arjak wrote: Wow, this is a great start! I played Beta 2 for a couple hours earlier today and I really like it so far. The terse, minimalist nature of the translated text actually adds to the feeling of mysterious dread that the game imposes. Are you planning to translate all of the text in the game? I'd love to be able to understand the intro, or even the item descriptions! The idea of this going all the way, and being the first full Japanese-to-English translation of a 3DO game makes me very excited! Thanks for giving it a play! The "Can't save here!" screen was already in English (Japanese games like to put really random things in English, still not sure why...) so I didn't touch it. I could probably edit out the Japanese text in the picture, I'll have to take a look at it later. I definitely want to translate the opening cutscene into English. Looks like with the tools posted earlier I should be able to generate a new animation file, but I don't know how easy it'll be. I don't think I'll be able to modify the short scene where he touches the doorknob and it breaks, but he really doesn't say much other than "wow this house must be old." I'm hesitant to bother with the item descriptions, but you're not the first person to ask for it so I should probably just do it lol. Some of them are interesting, some are just like "I really don't think this'll be any use" or "This rusty key can probably open a door somewhere lol. Since they all use the same background image, I should be able to just clean up one image to use as the background, then add all the items as separate layers in photoshop then save them off. I'll see what I can do over the weekend and post a 3rd beta if I'm lucky! ArcaneAria wrote: I definitely want to translate the opening cutscene into English. Looks like with the tools posted earlier I should be able to generate a new animation file, but I don't know how easy it'll be. I don't think I'll be able to modify the short scene where he touches the doorknob and it breaks, but he really doesn't say much other than "wow this house must be old." Could you explain why that particular scene would be a problem? Is it because the text is too long to read in the time it's on screen? Or that the line won't fit in the subtitle space? If either of those is the case, you could probably get away with re-writing the line slightly to be shorter. Something like, "Wow, what an old house," or even, "Wow, what a dump!" Something that gets across the same information in less space and time. I think the best policy is to make the translation as complete as possible. Otherwise, people could be put off by the random obvious bits of Japanese still in there. Personally, I'd much rather have the item descriptions before worrying about the background of that "Can't save here!" screen. The item descriptions are much more likely to frustrate players for being untranslated. Can't wait! Good luck with those cutscene animations! Arjak wrote: Could you explain why that particular scene would be a problem? Is it because the text is too long to read in the time it's on screen? Or that the line won't fit in the subtitle space? If either of those is the case, you could probably get away with re-writing the line slightly to be shorter. Something like, "Wow, what an old house," or even, "Wow, what a dump!" Something that gets across the same information in less space and time. So we can't actually modify the animation as much make an entirely new animation. For the intro, it's just white text on a black background. I can make 4 or so images and show them with a delay, should be simple. 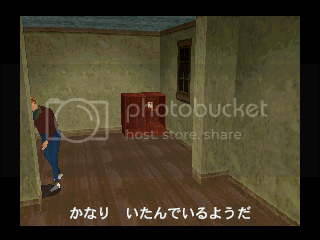 However for the house part, I can't recreate that entire animation with walking up to the house and everything. So there just doesn't seem a feasible way of doing it for that part. If anyone wants to help look, you can use the Opera tool to decompile the beta disc and poke around. I'll start working on the item descriptions and probably loop back to the opening after those are translated. I see I've been neglecting the homebrew thread for far too long, but it's great to see a project like this coming to fruition! Playing Alone in the Dark is one of the best experiences I've had with my 3DO, so the thought of being able to play this game from the same tradition in English is intriguing to say the least. I FOUND THE OPENING CUTSCENE! It's the OPDS file in the OrgData/stream folder! There's a few other cutscenes in that folder as well. I didn't see the post-Main Menu scene where you enter the house, but I'll keep looking! 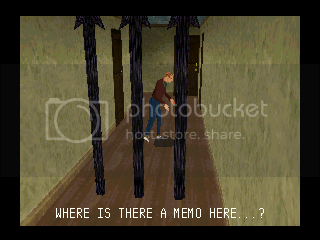 Arjak wrote: I FOUND THE OPENING CUTSCENE! Oh nice! How were you able to look at the file? On the progress front, I finished translating all the item descriptions and just need to photoshop them on the book images now. Strangely there's 2 different descriptions for the Dry Flower item, but only one is used that I can tell. I don't have the translation file with me atm, but the only real difference was "all the water has dried out but the flower strangely still looks alive" vs "this flower would still look good as decoration." The first is the one that the game actually uses, bit more interesting a line so makes sense. Oil Can's description is pretty much "All the oil has spilled and it's pretty useless" lol. Alright, just updated the files to the third beta! - All item descriptions have been translated. - Fixed an issue with the Silver Key being shown as "ER KEY" and spinning like a fan. I actually never found this key until I was testing just a bit ago. It's on the table in the room with the dry flower. - Added a text file to the zip with all the translations that I couldn't get into the game, mainly the game introduction text. So I glanced through the OPDS file and saw that it's the idle screen cutscene and not the opening dialogue. I still can't find the opening dialogue itself and I can't edit the idle screen animation easily either, so I just included the translation as a text file in the zip file. I'm thinking this build is feature complete, unless I figure out some way to get the animation text in. If no one finds any bugs in it or anything off, I'll probably change the banner image and call it released! For all you die-hard Doctor Hauzer fans, the whole one of you (and anyone else is welcome too )! - (Complete)Where does the Silver Key go? Found it, opens a door that would otherwise open if you come the other way. - Does the Oil Can do anything? - Is there any reason to take the Lithograph and trigger the trap? There's one line of dialogue that throws me off that seems to suggest the Lithograph might have been a key at some point? - There's an unused line related to the air vent, something like "Now the vent is no longer open." I think this is an unused line, but possible I missed it. Suggestion: A lot of the item descriptions talk about using the item "somewhere here," which is very awkward English. recommend changing this to "somewhere around here." Something about the way this line is written feels unnatural. I think it has to do with the wording. Thanks for the detailed investigations! Surprising what things I never thought to click on haha. I'll add the translations for those lines and recheck the others with the original script. A lot of the lines like "The outer was hasn't changed" are super short lines and have no real context in the script, so seeing it in context helps a lot. Let me know if you find anything else! Item #6 - When you find the first corpse, there's a line about "Why is it mummified?" The line uses the word 'dead', as if there were multiple bodies. The word 'corpse' would work better in my opinion. Item #7 - Examining the walls of the inside of the ruins gives you this line of Japanese, and then, strangely, a line in English. Item #8 - The conversation with Dr. Hauzer before the final confrontation feels very awkwardly worded. It doesn't flow naturally at all and feels very stilted. One thing that strangely stuck out to me was the line, "It's cause you're here..." I feel very strongly that 'cause' should be 'because'. 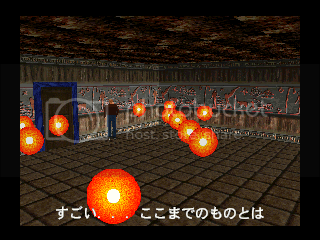 There's something that just feels rather undignified about the final boss when he uses such shorthand. Also, is the protagonist capable of responding with anything other than "It can't be..."? Seriously, he says that exact line two or three times in a single two minute conversation! In my opinion, the whole conversation needs to be gone over, line by line, and polished up, to make it both flow more like a conversation, and to be more dramatic. As is, it feels a bit comical. I tried to examine Dr. Hauzer without the picture selected, but no matter what, you always throw the picture when you get close enough. I tried going down the fireplace ladder without taking the picture, but the game won't let you, giving you a line basically saying that you don't have everything you need to continue. BTW, I like the little blooper reel that plays at the end! Also, I would really appreciate it if you could give me your best guess translations of any lines of Japanese still in the script and where they appear in it, so that when I play the next beta, I will have some ideas of where to look for them. Fixed the first two points, cleaned up the dead body line a bit. I'll add the lines you found that are still in Japanese then let you know what's left over. I think it's pretty much just a line related to the air vent. I think you're being a bit harsh on the final conversation part, but mostly I thought I cleaned it up alright. Do keep in mind the short character limit, I can only fit 28-32 characters per line, so it's hard not to make it stilted. I'll see what I can reword though. I'll change the first "it can't be" but there are only two instances of it. Adam's lines really aren't that interesting in Japanese, mostly just stuttering and "did you..." "it can't be..." "I can't believe it..."
I'll change the cause to because, oversimplification on my part. For the whole speech though, in Japanese he's using short form, so he's not talking formally at all. Short form is for casual conversations or when you're not trying to show respect at all. Pretty much saying his dialogue isn't one of a grand speech or anything as much as he's treating Adam as an intruder and unwelcome. 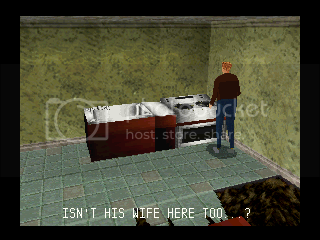 This whole game is pretty comical as well, since it's a campy 90's horror game, so comical seems fitting anyway . THAT'S RIGHT, I GOT IT. NO WAY... YOU REALLY DID IT...? THE CHERUB GRANTED IT TO ME. SO I LEFT THIS MORTAL WORLD. I'M IN A PLACE NEAR GOD. I AM INSIDE THE CHERUB. WHY'D YOU GO THIS FAR...? 2 YEARS AGO, GOD TOOK MY WIFE. SO I THOUGHT I COULD FIND HER. I THOUGHT I COULD SEE HER AGAIN. WE BOTH SHOULD BE IMMORTAL. THAT'S WHAT SHOULD HAVE HAPPENED. WHY IS MY WIFE NOT HERE!! YOU! IF ONLY YOU WEREN'T HERE! The "2 years ago, god took my wife" line bugs me a bit since it's read more like "god called my wife to heaven" but I can't fit that and "2 years ago" in a single line. That conversation is already looking much better! It's a lot easier to follow and much more natural than what was there before. The only lines that still feel a bit off are Adam's "That appearance?" and "Why did you go this far?" Everything else is a huge improvement. EDIT: One more thing I thought about after posting: The line, "Did you!?" would look better and be more consistent with the rest of the dialogue if you put an ellipsis in it, like, "Did you...!?" EDIT #2: Thought of yet another little tweak. Near the end of the conversation, Dr Hauzer uses lines that end in double exclamation marks. These lines are questions, so maybe "!?" would be better. Arjak wrote: That conversation is already looking much better! It's a lot easier to follow and much more natural than what was there before. The only lines that still feel a bit off are Adam's "That appearance?" and "Why did you go this far?" Everything else is a huge improvement. Sounds good, I'll work these changes in and post an update. Gonna be out of town till next week, so probably won't have it ready until then. The two edits make sense so I'll add those. Forgot to add the ? mark since Japanese often just uses か to indicate a question sentence . "The vent is useless like this." 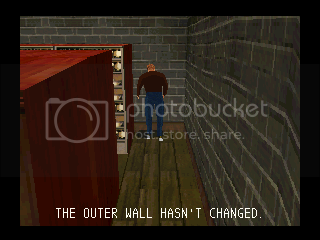 The problem with this is that you can't actually examine the vent cover without picking it up, so I don't see how you could trigger those first lines. Having the context of the room file was enough to add it to the script in case it is possible and I couldn't find it. I forget what the other Japanese line was, but it was simple enough to translate on its own. No more Japanese lines remain in the script file, so we should be good. Unless there's an item name or room name I forgot to translate, but I checked those a few times now. I'm thinking of finalizing this build after a week since I'm happy with it in its current state. Feel free to give it a go though and I'll look at any suggestions! This is great! I assume I can use a standard 3DO cue file to burn this?